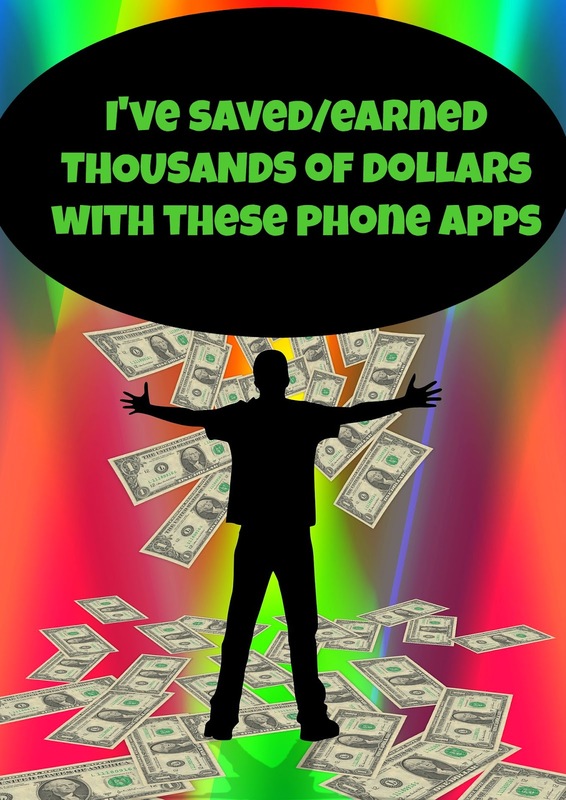 Books, Bargains, Blessings: I've saved and made thousands of dollars with these phone apps! 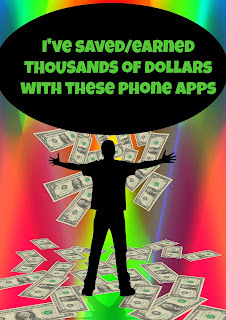 I've saved and made thousands of dollars with these phone apps! Not all apps are created equal, so I am going to list the apps in order of how much money I have saved and earned with them. Selling your stuff on eBay is super easy with the app. This is the one that has netted me the most money, but then again I love 'picking' and reselling. I like the app because I can take the photos, edit them, and create the listing all right on my phone or iPad. My husband lists on eBay occasionally, and he has never even listed from a computer, he's always listed from a mobile device. I also like the portability of it. There was one time I was sitting in a car listing and selling items I was listing. How is that for fast turn around? Store apps! You would be amazed at how much you can get back through the apps of your favorite stores. I don't really shop at Target, so I don't use Cartwheel, but I love Kroger, CVS, Walgreens, and Dollar General apps. There are coupons you can add to your cards and sometimes even freebies! Walmart's store app works slightly differently and you scan the QR code on your receipt after you shop there, and they will see if there are any advertised sales anywhere else in the area and refund you via a Walmart e-gift card. Even gas stations get into apps. I have Sheetz, 7-11, and Circle K on my phone, and there are often coupons there as well as purchase x number of items get one free offers. Cici's Pizza, Chilis, and Rita's Italian Ice have rewards programs. I am sure this is just a drop in the bucket of the many rewards programs and store apps out there, but these are the ones I use and am most familiar with them! I have saved the most with the Kroger, CVS, and Sheetz apps. I have gotten hundreds of dollars back with eBates. This is a shopping site, so you save money instead of making it. But often it will bring the price of what I need down to what I can afford. How it works is you start at eBates before you go to an online store. It not only will give you money back (sometimes as low as 1% or sometimes as high as 40% on very select magazines). But when you search for the store on the eBates site, it will tell you any coupon codes that are available. So it actually saves you money TWICE. Third, I have earned a few hundred dollars back from Swagbucks. This is a search engine, survey site, shopping site, and a place you can watch videos to earn SBs. SBs are a form of currency (they used to be called Swagbucks). You can turn them in for sweepstakes entries or gift cards. I usually turn mine in to Amazon. I have been using Ibotta for years. The concept is simple. You unlock deals, go to the grocery store (or shop through their website), and when you get the items home, you scan the barcode, upload the receipt and they will give you money for it. I really like how they have a number of rebates for things like any brand gallon of milk. It might only be 25 cents, but where else can you get a discount on milk. I rarely redeem enough rebates each month to make the 'teamwork' worth even looking at to me, but if you do, there are extra cash bonuses. The two things I don't like about this app is not all offers are available at all stores. Secondly, if you are required to buy multiple items for an offer they all have to be on the same receipt. I've lost out on money a couple times because I didn't see the requirements of a second item. The app that I love that allows you to shop at multiple stores for items is SavingStar. It works the same way Ibotta does, except with some you can purchase part of your items at one point and the rest at another. This makes it really nice if I have miscalculated and need to buy more for a refund. They also have higher value refunds than Ibotta seems to, but they also require higher purchases. For instance, you might have to buy $15 of products from a certain brand to get $4 back. But many times there is also a deal at Ibotta for the same item, and yes you can redeem on BOTH apps. Savingstar occasionally has a free item of under $1, and they also have a healthy offer of the week where you can save 20% on produce. The only thing is, you can only save on one purchase of it. For instance, when the offer was lettuce, I bought two heads of lettuce but was only able to get 20% back on one. A third app that works like Ibotta is Checkout51. Once again, sometimes there will be offers here and Ibotta or Savingstar. One time there was a coupon on my Kroger app, and I was able to turn the item in for a rebate at all three savings apps, and I actually MADE money by purchasing the product. That's not common, but you can combine these apps to really get some cheap groceries. They have a 'choose your own offer' for produce which gives you 25 cents back per week. I was skeptical of this app when I first downloaded it, but it's becoming one of my favorites. Some offers you can do multiple times. For instance, there was recently a coupon I loaded on my Kroger app to my Kroger card. I was able to use it five times -- and there was a refund within Checkout51 where I could get $1 back on up to five purchases. I was able to combine the savings for extra inexpensive groceries. This is the least high tech of the savings apps, and instead of depositing money in your Paypal account, they send you a check through the mail. If you haven't heard of Qricket, you aren't alone, not many people have. But if you sign up and use referal code 6E0482 you will get an extra 25 spins. You watch ads and then spin the wheel to win cash. The one thing I don't like about this is it pays out in Canadian dollars, so when you see you have $25, that's really about $18. But still, it's free money. There you have it, the list of apps that have saved me and earned me the most money over the years. It's fun to save money, and I often feel like these mobile apps make it feel like a game. Instead of hunting ducks or whatever it is kids do on their video gaming systems these days, I feel like it's a game to see how many groceries I can get for free -- or how much I can save when I do my Christmas shopping. The truth is, if you use these consistently, you will save and make a lot of money over time!